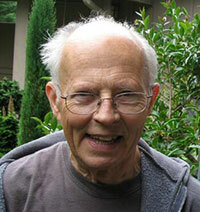 It is with deep sadness that the MPG community bids farewell to one of the great lepidopterists of the last century. We have received word from Eric H. Metzler, President and Managing Director of The Wedge Entomological Research Foundation (WERF), that Ronald William Hodges passed in December. Ron himself was a board member and played a major role in the development of The Moths of America North of Mexico. You can read more about him on his biography page on the WERF website. Much of what MPG is today is directly attributable to his work and we are very grateful and indebted to him. Below this section is the obituary prepared by his family. Since this page was last updated, there have been numerous additions and corrections I would like to share. But a comprehensive report on those changes will have to wait until after the new year. Instead, I will announce just one of the recent changes we have made. In honor of Ron Hodges, I present a new feature of MPG. We have added a Phylogenetic Sequence plate section which lists species using the phylogenetic sequence numbering system devised by Robert Patterson and later adopted in 2010 by Don Lafontaine and Chris Schmidt in their seminal "Annotated check list of the Noctuoidea (Insecta, Lepidoptera) of North America north of Mexico". In 2016 this list was extended to cover the rest of North American Lepidoptera in the provisional check list "Annotated taxonomic checklist of the Lepidoptera of North America, North of Mexico" by Greg Pohl, Bob Patterson, and Jonathan Pelham. With the help of Greg Pohl, we have updated the MPG website accordingly. We view this new system as the next step in the evolution of the the Hodges 1983 Check List. "Ronald William Hodges, 83, died at his home in Eugene, Oregon, on Sunday, December 10, 2017. He was preceded in death by his wife, Elaine Rita Snyder Hodges, after 39 years of marriage. Ron was born on August 7, 1934, in Lansing, MI, an only child to parents Elma and Lester Hodges, and became interested in Lepidoptera at age six upon finding a freshly emerged Luna moth in the backyard of his Michigan home. He stated his intent to update Holland's Moth Book as a ninth grader. He received his BS degree in 1956 and his MS degree in 1957 from Michigan State University, where he was strongly influenced by Roland Fischer. He went to Cornell University to work with John Franclemont. During this period he did extensive field work in New York, North Carolina, Florida, Arizona, and Ecuador. He became deeply interested in the microlepidoptera, particularly the Gelechioidea, and was awarded a PhD degree in 1961. He received a National Science Foundation Postdoctoral Fellowship and commenced to work on genera of Gelechiidae. This project was interrupted when he accepted a position with the Systematic Entomology Laboratory at the U.S. Department of Agriculture, Agricultural Research Service located in the Smithsonian National Museum of Natural History, Washington, D.C. He had several roles in the Laboratory, including laboratory chief. He stepped down from this position to continue field and laboratory research on gelechioid moths. At the Smithsonian, he met Elaine, a scientific illustrator, and they married in 1967; Ron adopted her two sons, Steven and Larry. He was a member of the American Association for the Advancement of Science, American Association for Zoological Nomenclature (president 1993-95), American Entomological Society, Entomological Society of America, Entomological Society of Canada, Entomological Society of Ontario, Entomological Society of Washington (honorary member, 1999), Michigan Entomological Society, the Lepidoptera Research Foundation, the Lepidopterists' Society (president 1975-76), Maryland Entomological Society (president 1973-74), Ohio Lepidopterists, Northwest Lepidoptera Society, Sigma Xi, and Societas Europaea Lepidopterologica. He received the Thomas Say Award from the Entomological Society of America for his editorial oversight of Moths of North America in 1990, the Karl Jordan Medal from the Lepidopterists' Society for research on gelechioid moths in 1997, and he was elected an honorary member of the Entomological Society of Washington in 1999. Ron was active until retirement in the Washington Biologists' Field Club since being elected in 1963. He was president from 1976 to 1979 and participated on various committees and work and field days. He was for many years the lead cook in the kitchen. In 1997, Ron and Elaine retired to Eugene, Oregon, where he continued to work on moths (an illustrated, annotated key to genera of North American Gelechiidae) and, until 2011, to edit and publish The Moths of America North of Mexico. Gardening with a highly diverse array of plants and developing and maintaining a collection of mainly pleurothallidine orchids also have interested him in retirement. In his spare time, Ron gardened a highly diverse array of plants, enjoyed classical music and paired gourmet meals and wonderful wines. Survivors include Steven and Susan Hodges of Santa Barbara, California, and Lawrence Hodges of Germantown, Maryland; two grandchildren; two great-grandchildren; his cousin Ann Haseltine of Ishpeming, MI; and Elaine's siblings and their families. Ron will be remembered for his big heart and generosity. He loved to share his garden, food, wine, music passions with his many friends and family. Sensitive to every dangling participle, "can I?" and "may I?" were distinguished, as were the salad and dinner forks. He is missed."